September. This is, along with October, part of that awkward time of the year where nothing really good tends to come out at the movies. The big summer blockbuster season has officially ended and we’re still a bit early for the awards season stuff and the big holiday releases. Typically we get stuck in a glut of cheap horror movies, bad comedies, and usually an awful kids’ movie or two. Sometimes, though, a high concept genre film that wasn’t big enough to hit during the summer will drop in, but the success rate of those tends to be mixed. For example, right around this time last year In Time was released, a film which absolutely squandered its unique and interesting concept with the combination of a shallow narrative and poor execution. 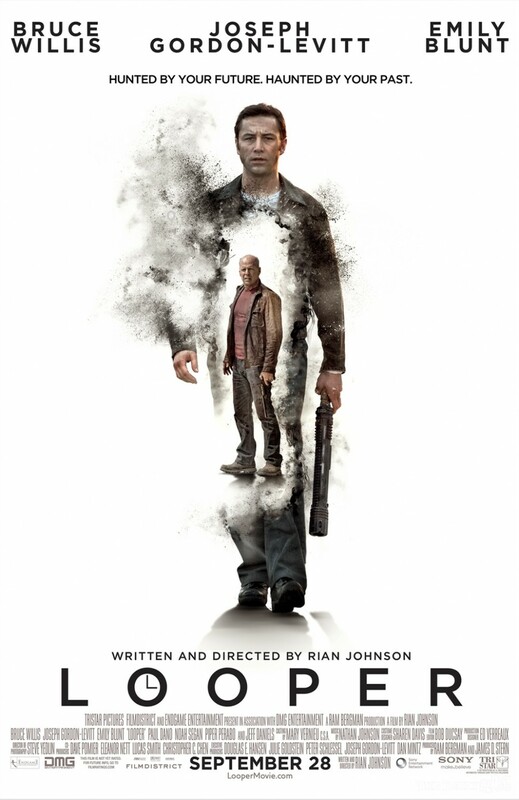 Looper, on the other hand, is everything In Time should have been. Looper, starring Joseph Gordon-Levitt, Bruce Willis, and Emily Blunt is set in the year 2044 where time travel has not yet been invented, but 30 years from then it will be. In that future, crime syndicates have gained widespread power, but due to advances in technology, murder and disposal of bodies has become increasingly difficult. The solution they have found to this problem is hiring hit men in the past called Loopers to execute and dispose of the people the mob wants gone; sending them back in time, bound and gagged, to meet with the business end of a Looper’s blunderbuss. The story follows Joe, a Looper who is leading an extravagant, but self-destructive life off the considerable paycheck he gets for his particular line of work. However, that all changes when one day the person who is sent to be killed happens to be himself, 30 years from now. Let me just cut right to the chase, Looper is incredible. It’s the kind of truly unique, smart, entertaining, well told, and exciting film that reaffirms why we love the movies in the first place. I had been hearing some really high praise for this film so I went in with high expectations yet I was still completely blown away. The film understands its themes, its settings, and its characters, and uses all of these elements to their fullest effect. It never cheats by betraying its own integrity, and because of that is able to craft the best time travel story I’ve seen in years. Time travel is always a tricky thing to tackle. The very nature of it comes prepackaged with messy paradoxes and inconsistencies, but writer/director Rian Johnson establishes very clearly his rules for time travel in a way that doesn’t get bogged down in endless exposition. It trusts is audience to be smart enough to fill in the details and sets up only as much of the mechanics as are necessary for the story. Because of that, though this is the kind of movie that certain types of people will hate (mostly stupid kids on the internet pretending to be smart) because they’ll focus on trying to pick out any logic flaws with the plot and utterly miss the point of the narrative. However, despite being based around a plot device as inherently messy and illogical as time travel it establishes its rules firmly and never deviates. If you dig deep enough you’re sure to find holes in the plot, but the narrative is absolutely rock solid, and that’s what really matters. Every element of this film helps to sell the story. The future in Looper feels like a real place and each scene is full of little details that, while never highlighted, help ground the film and paint a more vivid picture of this world. The film also boasts a slew of excellent performances. Gordon-Levitt and Willis are the obvious standouts, brilliantly playing the same person separated by 30 years of life experience. It’s somewhat incredible how they have managed to capture the duality of that relationship; the reality that while you may be the same person in the literal sense, age and experience fundamentally changes who you are. It’s an interesting theme and the film handles it masterfully, illustrating how time can change a person’s goals, their priorities, and the things they are willing to sacrifice. I do kind of wish, though, that they hadn’t given Joseph Gordon-Levitt the Bruce Willis makeup, because at times it can be slightly distracting, and the performances are honestly good enough to sell that these two characters are the same person without the need for makeup. It’s a small complaint, but it’s about the most I can find fault with in this film. The performances from the secondary characters also shine quite a bit in their own right. Every character feels real and textured, and it all contributes to the reality of this world. The film also impressed me by not taking the obvious route concepts like this tend to take; instead it charts its own unique territory, creating a truly memorable experience. In some alternate universe there’s probably a version of this movie that does exactly what you’d expect a film like this to do, and it’s probably a solid and entertaining film. However, by taking the story in a direction that is different and unexpected Looper is so much more effective. There were several times during the film where I marveled at the quality of the story telling, taking seemingly throwaway details and later using them to lead to genuinely smart and surprising developments. Nothing in the film is wasted. Expectations are turned on their heads, and just about every time you think you’ve figured out where the film is going it will either go a different direction or get there in a way that is surprising. Despite this, it still remains absolutely true to itself and every single twist or development has the feeling of unexpected inevitability that is so crucial yet so hard to achieve. I have seen some others criticize a tonal shift that occurs part way through the film, saying it betrays the character of the movie, but I disagree. Without spoiling anything, I feel the shift in tone is absolutely necessary for a few reasons. First it subverts expectations, and allows the film to explore new territory. It moves things off the course you would expect the film to take and instead creates a different path to the end goal, one that is so much more appropriate for the story. This section of the story is also where the film is allowed to explore in depth a lot of its major themes and deal with most of the character development in a manner that wouldn’t have worked otherwise. Most importantly, though, it is essential for setting up the climax of the film where all the pieces begin to fall into place. The time taken to explore these themes and the characters in a more intimate setting is what allows the payoff of the film to be as strong as it is. Looper is a fantastic film. It masterfully combines action, suspense, genuinely smart twists, and is all grounded by a compelling setting and a strong element of human emotion. It has jumped to the top of my favorite films of the year list, and is arguably one of the best time travel stories I’ve ever seen. I highly recommend this one. It is an absolute breath of fresh air and the kind of film that makes you fall in love with the movies all over again. Next Next post: A few hours ago in a Hollywood office far, far away….